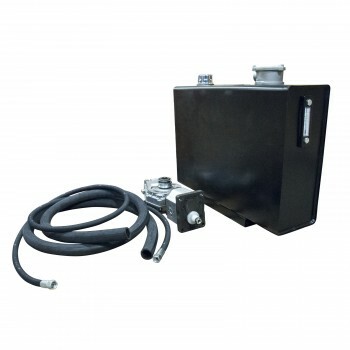 Hydraulic pump with tank for the tractor's PTO<\/h2> Compensates for a low oil flow from tractors with lower hydraulic capacity, making it possible to work with cranes or other equipment that require a flow. Or to separate the oil system from the tractor's when there are different oil qualities in different pieces of equipment. Large tank, 75 l, this is a benefit as high flows generate heat and the oil then has time to cool down in the tank. Clear level glass with temperature display, return oil filter and large filler cap. Supplied with basic set of hose and couplings, additional fixtures may be needed depending on requirement. Compensates for a low oil flow from tractors with lower hydraulic capacity, making it possible to work with cranes or other equipment that require a flow. Or to separate the oil system from the tractor's when there are different oil qualities in different pieces of equipment.